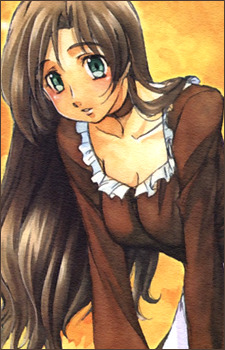 Wikipeida: Yukiko is the owner of the inn "Pink Amigo" in the Eldorado Five's hometown. She is the granddaughter of the late Chizuru Steavens, one of the members of the Eldorado Five. Yukiko has a soft spot for the remaining members and the sound of her beautiful voice when it sings always calms them down when their about to create a ruccus. When the Eldorado Five joins Van's company to save the world, she decides to go as well to care for the aging group. Just before The Claw is defeated, a relationship seems to develop between Yukiko and Joshua, and she decides to go with Joshua to help find Volokain's remains.